This is summer vacation time in Islamabad for school going children but not for Afghan scavenger children who in their ragged clothes, unwashed faces travel long distances everyday to pick recyclable waste in their waste collection bags from waste dumping points located in markets, residential areas as well as hospitals. Their parents are unskilled, illiterate and live in abject poverty. 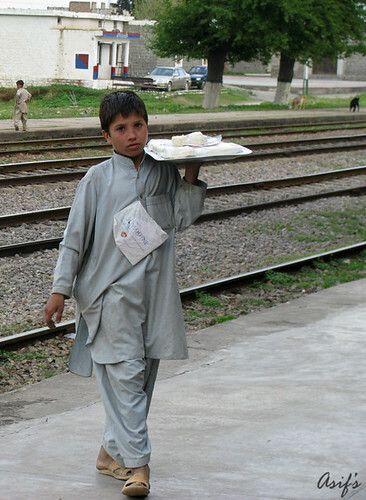 Parent’s poverty forces these kids into scavenging. While other children of their age are going to school, these scavenger children become earning hand of their poor families living in abject poverty. Nevertheless, they are not only exposed to various health hazards but also become victims of sexual abuse. We should appreciate the hard toil of these scavenger children because they, unlike hundreds of beggar children found begging in various markets and roads of Islamabad, are not begging but are earning their living through hard means. Despite the fact that the Government of Pakistan is a signatory of the Convention on the Rights of the Child 1989, the steps taken by the government to protect children rights are still invisible. I wonder if this is the sorry state of affairs in Islamabad as far as the implementation of Convention on the Rights of the Child 1989 is concerned then what would be the situation of child scavengers in other parts of the country. My question to all of you is what our government should do to protect child scavengers from all sorts of exploitation and hazards? Should the government ban scavenging altogether keeping in view the associated health hazards for scavengers and promote a culture and awareness of recycling at the household level as is done in developed countries or should the government formulate a comprehensive policy for the rehabilitation of scavenger children while providing them free education and offering their poor parents some monitory assistance or should the government continue doing business-as-usual? he is selling sweets to the world…..
in the age of geting sweets from the world… he is selling sweets to the world…, originally uploaded by Asif-. When cities age, every piece of architecture, marketplace, garden or park, face, road, etc… everything begins to exude the essence of the bygone years, and the impact those years have made on the particular city. In the case of Lahore, one can see the remnants of the colonial era on the Mall road, and in the architecture of the buildings. In places like the Shalimar gardens and the Lahore fort one can see the grandeur of the Mughal empire and can easily envision their lifestyle. The Lahori culture and tradition, the mannerisms of the people, the dynamics of the Lahori people, everything has been created over a course of hundreds of years. Islamabad being a relatively younger city has a long way to go in creating it’s own ‘history’. One can think of this city as morphing into a concrete metropolis with skyscrapers crammed up together on every major road, flyovers flying over our heads, millions of cars plying the erstwhile empty roads, and more places of amusement in every major sector. One can even think of it as turning into a highly industrialized city with smoke spewing out of every building in every corner, with a plethora of cycles and cheap broken rickety cars creating havoc on the mismanaged roads, and with people walking around with gas cylinders mounted on their backs and gas masks on their heads. Ok that was just an exaggeration… but how would YOU like the Islamabad of the future to be? What changes do you think are going to take place in this city over the course of the next one hundred years?